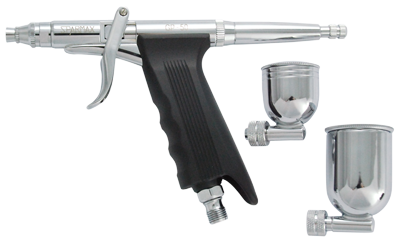 The Sparmax GP-50 Pistol Trigger airbrush offers simple, ergonomic operation and the 2 side feed metal cups make colour changing quick and easy. It has a 0.5mm needle and nozzle combination for general purpose, high paint flow spraying and wider spray patterns. Featuring a pre-set handle, this airbrush allows even the beginner to spray consistent coverage or consistent lines and prevents accidentally pulling back too far to flood the surface you're spraying.